One of the high altitude mountain passes in the Indian Himalayan region and located at an elevation of 5,495 meters, Sin La in the Kumaon Himalaya in Pithoragarh district of Uttarakhand is an incredible trekking destination that haunts travellers. The Pithoragarh Sin La Trek navigates across lush green fields, remote villages and virgin forests and further it connects Bidang in Darma Valley to Jolingkong Lake in the Kuthi Yankti valley. 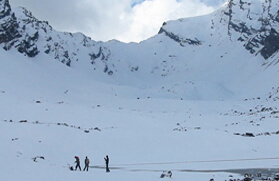 Sin La was an ancient trade route of the Bhotiyas to Tibet and it is blanketed with snow all year round. One can enjoy and capture in his frame the magnificent sight of the Adi Kailash Peak that stands at a height of 6,191 meters. 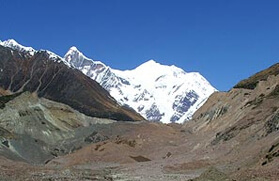 The Pithoragarh Sin La Trek, which is one of the moderate to challenging treks in the Kumaon Himalaya region, starts from Pangu, which is approximately a 144 kilometers drive from Pithoragarh. From Pangu the trek snakes through a dense wood and cut across several streams to Gala, which is approximately 23 kilometers away. From there, the journey leads to Gunji at 3,500 meters via Budi. The trail from Budi to Gunji has a steep climb and one has to walk through a boulder ridden track. From Gunji the trek to Jolinkong, which is approximately 17 kilometers away, is filled with several obstacles like uphill, downhill and narrow tracks randomly scattered and sharp twists. From Jolinkong a steep climb heads to Parvati Lake and then the route snakes to Daktu via Bedang and winds up at Sin La. 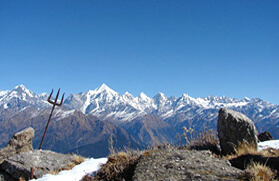 From Sin La the downhill trek follows to Baling, which is approximately 18 kilometers away and descends to New Sobla, wherefrom the motorable road starts and one can drive to Almora via Dharchu La. Pithoragarh- Pangu-After breakfast 144 kms drive from Pithoragarh to Pangu. Dinner and overnight at camp. Pangu- Gala- After breakfast 23 kms Trek to Gala. Dinner and overnight at camp. Gala- Budi- After breakfast 22 kms trek to Budi (2740 m). Dinner and overnight at camp. Budi- Gunji- Trek 17 kms to Gunji (3500 m). Dinner and overnight at Camp. Gunji- Kutti- Trek 18 kms to Kutti . Dinner and overnight at Camp. Kutti- Jolinkong- Trek 17 kms to Jolinkong. Dinner and overnight at Camp. Jolinkong- Parwati- Jolinkong-Trek 4 kms to lake Parwati and back.